I spent this week researching, photographing, and compiling my "Guide to Squash Blossoms in DC" for Brightest Young Things. Squash Blossoms are the flowers that grow on squash (usually zucchini), that only bloom for a couple of weeks, usually around July. When a farmer clips a squash blossom to sell, they sacrifice the rest of the plant. This makes them extremely rare, but this year we're seeing an unusually long squash blossom season- if you're lucky, you'll be able to enjoy them for a couple more weeks. Below are the dishes I photographed for the guide, but make sure to read it for the complete list! Casa Luca: Fritto Misto featuring squash blossoms (stuffed with a light herb ricotta and marscapone), shrimp, zucchini and baby artichokes. Served with a spicy tomato sauce and a basil pesto. Casa Oaxaca: Tempura battered Ricotta stuffed squash blossoms served with a spicy hibiscus salsa. Oyamel: Cold Corn Soup (with Good Fortune Farm tomatoes and squash blossoms), Squash Blossom Quesadilla (served with salsa verde cruda con aguacate), Squash Blossom Tamale (with fresh corn and chicharrones), and Squash Blossom Veracruzana (stuffed with Westfield Farm Goat Cheese and plancha seared with Veracruz sauce). 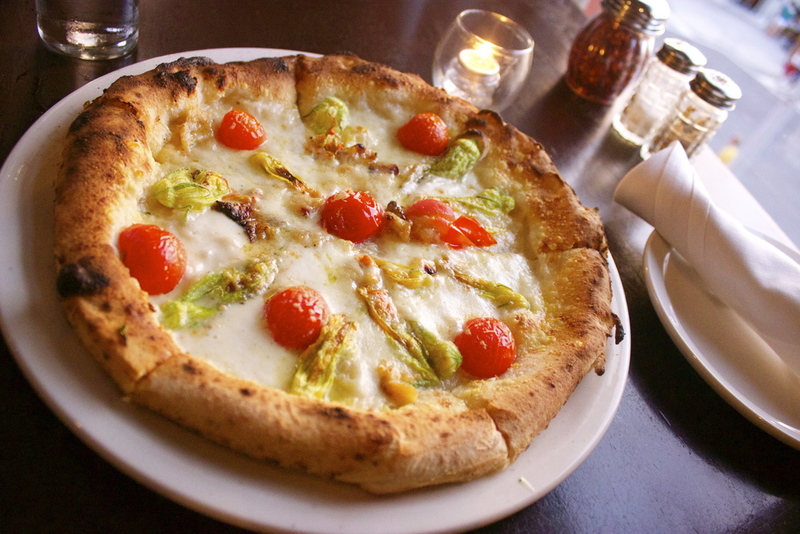 RedRocks Firebrick Pizza: A white pizza with an olive oil base, burrata, garlic, cherry tomatoes, and squash blossoms. Restaurant Nora: Squash blossoms stuffed with smoked ricotta, spinach, wilted onions and chanterelles, battered in cornmeal tempura, and flash fried. Served with tempura zucchini, cherry tomato confit and corn veloute. Ripple: Tempura fried squash blossoms in puddles of tangy dill yogurt and served with and Maryland blue crab cakes. Tabard Inn: Ricotta stuffed squash blossom tempura, served with spicy strawberry and tomato jam. Table: Escargot ravioli with a ratatouille of zuchinni, tomato, red pepper, eggplant, purple basil and ricotta-stuffed squash blossoms with saffron.